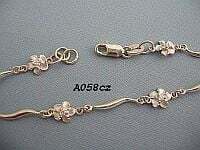 Sterling Silver Hawaiian Plumeria (frangipani) wave link anklet. Features frosted finish 6mm diameter frangipani flowers, each with diamond cut petal edges and central eyes of clear cubic zirconia, all linked by polished scrolling wave bars. Also available without CZ's and with flower eyes of cubic zirconia in these other colours: blue and pink.